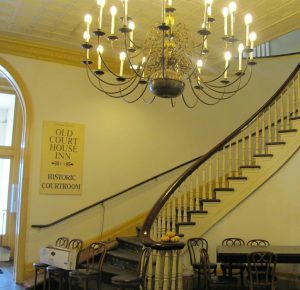 Friends love to share their favorite things with others and Friends of the Old Courthouse is now offering to share their favorite building with all interested parties. Free public tours will be offered at the Old McHenry County Courthouse, 101 N. Johnson Street, on the Woodstock Square on the First Saturday of each month from 10am-1pm. The history and usage of the 1857 landmark building, and the adjacent 1887 Sheriff’s House, as well as the many architectural and design features not typically available for viewing, will be explained in detail by trained docents. Tours take approximately thirty minutes. STARRING: BRIAN SAGER, BRIAN AND KATHRYN LOPRINO, JACKIE SPECIALE, JOE STARZYNSKI, WOODSTOCK POLICE DEPARTMENT, WOODSTOCK FIRE DISTRICT, TINA HILL, DAN HART, LAURA WITLOX, STEVE GAVERS, DENISE GRAFF PONSTEIN, DARRIN FLYNN, JACK FRANKS, PAM ALTHOFF, PETER AUSTIN, RALPH SARBAUGH, AND CHERYL WORMLEY. Only $10.00 plus $2.50 shipping and handling online or $10.00 at the Old Courthouse Arts Center, Woodstock Opera House, and Read Between the Lynes. Click here to buy online. An all Woodstock related activity book celebrating Woodstock Willie and Groundhog Day! 100% of publisher royalties from the sales of this book are being donated to Friends of the Old Courthouse. Many thanks to Wendy Bauer Piersall and Woo! Jr Kids Activities! Buy yours now at Read Between the Lynes on the Woodstock Square or Amazon. The Old McHenry County Courthouse, built in 1857, is one of the oldest buildings on the historic Woodstock Square and together with the Sheriff’s House are among the Square’s most prominent features. Our mission is to preserve these historically significant buildings so they can become cultural and economic drivers for the City of Woodstock and McHenry County for generations to come. Buy our local photography book! Nearly 70 photographers throughout McHenry County participated in our special fundraising project, capturing the warm and exciting moments that make up a typical week in McHenry County. This high quality timeless book is hard-cover, 14” x 11”, and features 100 pages of images that reflect the people, animals, landscapes and businesses across our beautiful county—a treasured keepsake, a thoughtful gift, a great incentive or reward, and an attractive and welcoming addition to reception areas, libraries and educational facilities. Click here to purchase a book.